Rooted in folk-rock and woodsy Americana, the Moondoggies take influences from such vocally inclined groups as the Byrds, the Band, and the Flying Burrito Brothers. Although hailing from Seattle, seeds for the band's formation were planted in nearby Everett, WA, where Kevin Murphy (vocals, guitar), Robert Terreberry (bass), Carl Dahlen (drums), and Caleb Quick (keyboards) formed a teenaged band while attending Cascade High School. The students discovered their talent for three-part vocal harmonies, and when Murphy returned from a summer-long stay in Alaska in 2005, the four friends reconvened in Seattle to form the Moondoggies. Taking up residence at a local dive bar named ~the Blue Moon Tavern, the Moondoggies honed their craft and soon netted a contract with Hardly Art, an imprint of Seattle's own Sub Pop Records. Don't Be a Stranger, the band's woozy debut, appeared in 2008, with the mature Tidelands following in October 2010. Big Bear native Luke MacMaster never meant for his music to be popular, and he certainly never thought he’d be a rock star. It just kind of, well, happened. MacMaster moved to Big Bear as an infant with his parents from Simi Valley. After graduating from Big Bear High School, he left for Los Angeles. “I had that small town kid in the big city mentality,” he said. While attending Santa Monica City College, MacMaster dove into writing everything from poetry to stories. Not knowing what path he wanted to take, MacMaster transferred to Biola University in La Mirada to explore art. “I went to the school to learn about art and ended up learning about music,” he said. MacMaster didn’t pick up a guitar until 2003. It was then he co-wrote his first song for the band The Colour. As MacMaster developed as a solo singer/songwriter in L.A., he made friends with the touring band Dawes, and Kings of Leon guitarist Matthew Followill, gaining more access to musical culture. During a stop on a tour in April 2010, Dawes singer Taylor Goldsmith noticed remarkable talent coming from an untitled jazz group in Arkansas. Goldsmith contacted MacMaster and told him he had to hear the band. MacMaster flew to Arkansas to meet the group, hit it off with them and The Romany Rye was formed. The Romany Rye was named for a book MacMaster says he fell in love with during his extensive time reading. “The Romany Rye” by George Barrows is a story about an educated man trying to keep his family name and wealth. The man was thrown in with a band of gypsies and became infatuated with travel. It’s a story MacMaster says he can relate to. With a unique sound fusing country, rock and roll, and soul, The Romany Rye fell onto the fast track. They were immediately offered two tours and accepted. 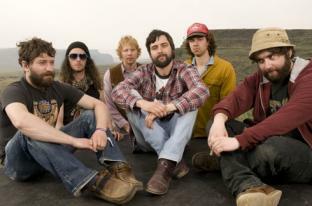 The group toured nationally with the band Delta Spirit in June and July 2010, and then with Dawes in October and November. “We were baptized through fire with each other,” MacMaster said. The Romany Rye released their first record “Looking Back Carefully” in October 2010. The second album is set to release in July. As if the hard work wasn’t already paying off, the next big break became a possibility with Rolling Stone magazine. The publication is hosting an invitation-only contest, Do You Wanna Be A Rock & Roll Star? Fans vote for one of 16 bands in the U.S. to be on the cover of Rolling Stone. The winning band also gets a recording contract with Atlantic Records. Samples of each of the bands’ music is posted on the magazine’s website www.rollingstone.com/choosethecover.